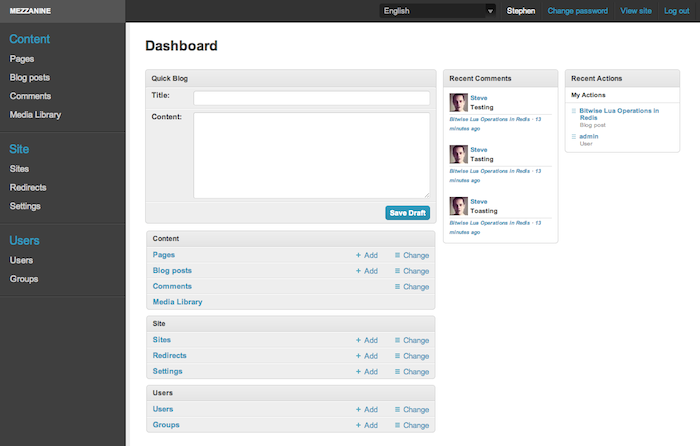 Mezzanine is a content management platform built using the Django framework. It is BSD licensed and designed to provide both a consistent interface for managing content, and a simple, extensible architecture that makes diving in and hacking on the code as easy as possible. Mezzanine resembles tools like Wordpress, with an intuitive interface for managing pages, blog posts, form data, store products, or any other type of content you can imagine. Mezzanine takes a different approach from other Django applications in this space like Pinax or Mingus that glue together a lot of reusable apps, instead opting to provide most of its functionality included with the project by default. Mezzanine's admin interface works with all modern browsers. Internet Explorer 7 and earlier are generally unsupported. The createdb is a shortcut for using Django's syncdb command and setting the initial migration state for South. You can alternatively use syncdb and migrate if preferred. Settings defined in the settings module. URL patterns defined in the urls module. Static assets in the site_meda directory. The call to mezzanine.utils.conf.set_dynamic_settings at the very end of the settings module. Mezzanine is an open source project that is managed using both Git and Mercurial version control systems. These repositories are hosted on both GitHub and Bitbucket respectively, so contributing is as easy as forking the project on either of these sites and committing back your enhancements. Contributed code must be written in the existing style. This is as simple as following the Django coding style and most importantly PEP 8. Contributions must be available on a separately named branch that is based on the latest version of the main branch. Run the tests before committing your changes. If your changes causes the tests to break, they won't be accepted. If you're adding new functionality, you must include basic tests and documentation. The following modules have been developed outside of Mezzanine. If you have developed a module to integrate with Mezzanine and would like it listed here, send an email to the mezzanine-users mailing list. mezzanine-html5boilerplate - Integrates the html5boilerplate project into Mezzanine. mezzanine-mdown - Adds Markdown support to Mezzanine's rich text editor. mezzanine-openshift Setup for running Mezzanine on Redhat's OpenShift cloud platform. mezzanine-stackato Setup for running Mezzanine on ActiveState's Stackato cloud platform. If you would like to make a donation to continue development of the project, you can do so via the Mezzanine Project website. For general questions or comments, please join the mezzanine-users mailing list. To report a bug or other type of issue, please use the GitHub issue tracker.